Horsetail weed is difficult to kill because the waxy coating on the leaves prevents herbicide sprays from penetrating the plant to kill it. Fortunately, once you are aware of this plant's secret defense, you will have a good shot at getting rid of it over the course of one or two growing seasons. The best way to handle this pesky weed is through a combination of tactics that limit the beating surrounding vegetation will take as you try to kill horsetail weed. Pry the horsetail weed, roots and all, from the soil by positioning the gardening fork tines so that the plant is sitting above them and the roots are hanging below them in loose soil. Work as much dirt away from the plant as possible before you pull it up to avoid breaking off the roots, which will generate new weeds. This technique works best when the soil is damp. Be very gentle as you remove the horsetail from the ground, and dispose of weeds and weed pieces in the plastic garbage bag. Douse any stubborn horse tail weeds with vinegar. Vinegar will kill just about any plant, so keep the vinegar on the horsetail itself and on the ground around it. Crumple the horsetail leaves. Use your gardening gloves to protect your hands. Crumpling the leaves will make the horsetail weed more susceptible to chemical herbicides. Treat the horsetail with the herbicide containing ammonium sulphamate. This ingredient is common in brushwood killers. 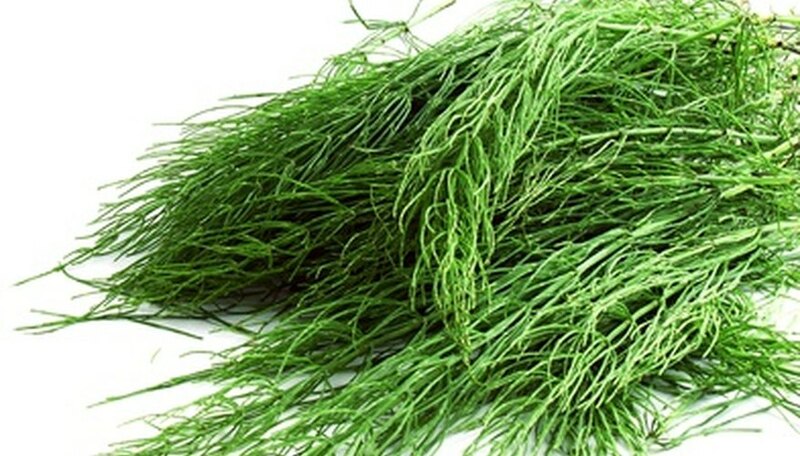 Spray the horsetail weed thoroughly with the chemical, hitting the tops and bottoms of the leaves. Check the manufacturer's information to determine if you can spray the area around the horsetail weed or if you need to restrict spraying as much as possible to protect surrounding vegetation. Different products may have different requirements. You will probably need two or three treatments as the horsetail dies back and new shoots come up. Clear out dead horsetail as it responds to the weedkiller.